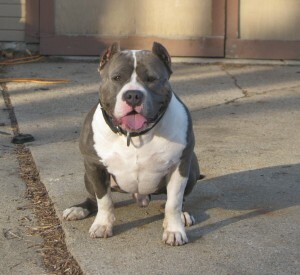 • The distinct heavy, large and broad head of the American Bully exemplifies breed type. Faults: Blue eyes. Overly visible haw. Serious Faults: Both eyes not matched in color. Faults: Level bite, overshot bite, undershot bite and wry bite. Serious Faults: Severely overshot or undershot bites, measuring 1/4 inch or more. Faults: Hocks turning in or out (slight turn out accepted in the XL and Extreme varieties). Narrow hindquarters; straight or over-angulated stifle joints; bowed legs. 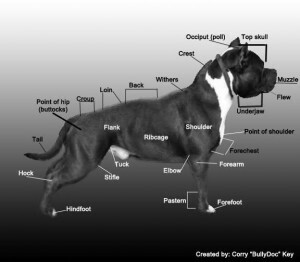 Faults: Tail to long or too short approximately up to an inch above or below point of the hock. Gay tail (carried over the plane of the back). Serious Faults: Kinked or knotted tail. Extremely short tail. Disqualifying Faults: Screwed or Bobbed tail. Faults: Curly or wavy coat. • All colors and patterns are permissible except the color merle. o Males under 17″ – 20″ at the withers. Females under 16″ – 19″ at the withers. • Albinism nose (light pink) Nose turning up or pushed back.